Copper-free click chemistry is a fairly new chemistry that has been commercialized during the past few years. More and more click chemistry based reagents are becoming available commercially which makes the formulation development much easier for scientists. The great advantage of this chemistry is biocompatibility since no cytotoxic copper catalyst is required. By far, click chemistry is the most efficient and easiest conjugation chemistry available for coupling of antibodies and other reactive ligands to the surface of the liposomes. The conjugation chemistry is based on the reaction of the dibenzocyclooctyne (DBCO) reagent with an azide linker to form a stable triazole. 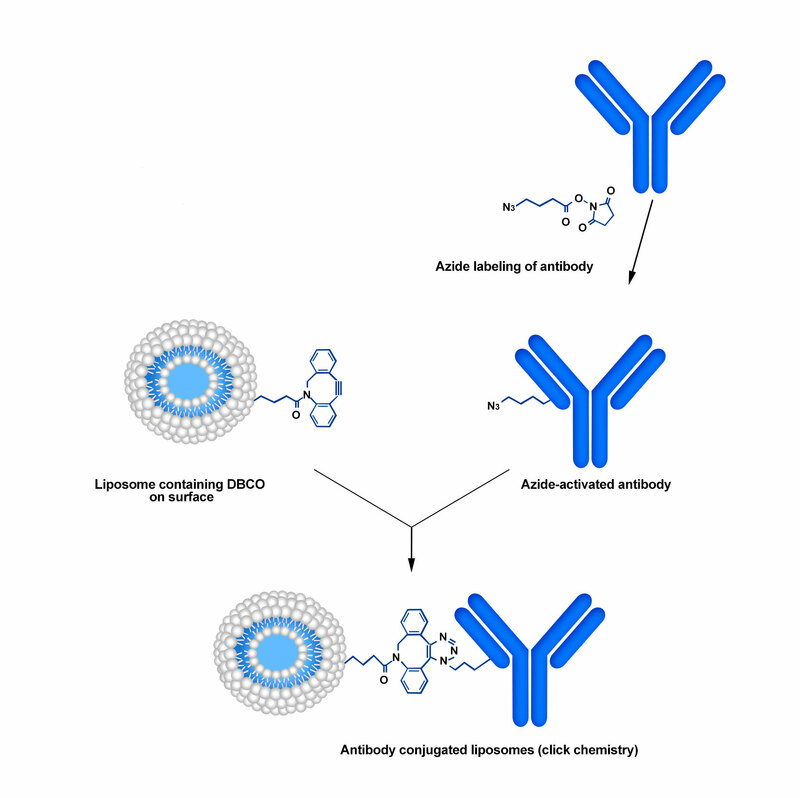 DBCO moiety can be on the antibody and azide moiety can be on liposomes and vice versa. This conjugation protocol is based on the reaction of the dibenzocyclooctyne (DBCO) group of the liposomes with an azide linker on the antibody, peptide or proteins. There are many commercialized reagent that can be used for azide modification of proteins, peptides and antibodies. To see the list of commercialized reagents for azide modification see here. The total lipid concentration in ImmunoFluor™-DBCO is 21.58 mM. 1% mol of the lipid in liposomes contains DBCO group and only half of them are exposed to the outside of the liposomes, which is equal to 0.11 mM of reactive conjugable lipid. For 2 ml volume liposome, this is equal to 2.20×10-7 mol of DBCO. Add 2.5 mol equivalents of DBCO-lipids in liposomes to 1 mol equivalent of Azide containing protein. Incubate the mixture of liposome and antibody at room temperature for 4 h followed by overnight incubation at 4 °C in a refrigerator.